Do you know why you do what you do? Deep within you are powerful forces that drive and motivate your behaviors – these are your personal values. They are the invisible force behind the decisions you make and the actions you choose. If you can identify and articulate your personal values, you will have a powerful tool to use in making decisions. The decisions that you make that are in alignment with your personal values are the ones that will feel right, give you the most energy, and lead you to the greatest sense of fulfillment. You may have one strong personal value, or you may have many. They may include a desire to achieve, be recognized, create, or help others. They may include a desire for security, social interaction, or pleasure. And there are many other possibilities. Dig deep, identify your personal values, and use them as touchstones for making important decisions. In order to identify your personal values, think back to a moment when you felt truly fulfilled. Now ask yourself – Where was I? Why was I there? What was I doing? Who else was involved? What made the experience so fulfilling? Think about two other life experiences – either personal or professional – where you also felt a sense of fulfillment, and then ask yourself the same questions. By looking for the themes and deeper meanings in your responses, you will begin to see your personal values woven throughout these experiences. Make a list of these, paying close attention to how they come into play in your day to day interactions and decisions. When you have an important decision to make, consider how closely each choice aligns with your personal values. 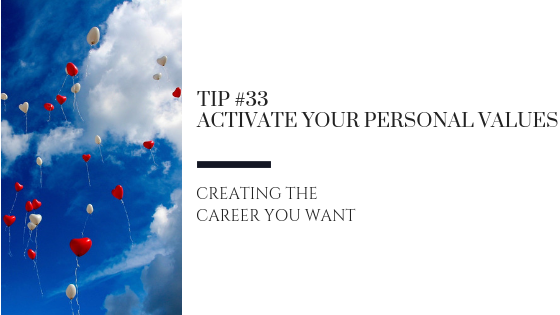 Use your personal values as touchstones and guideposts to help you create the career and the life you want.